“Children, obey your parents in the Lord, for this is right. ‘Honor your father and mother’—which is the first commandment with a promise—‘that it may go well with you and that you may enjoy long life on the earth’” (Ephesians 6:1-3). As you know, children don’t naturally obey and honor parents; they must be taught. On this Mother’s Day, I want to reminisce about my own mother and some lessons she taught me. First, Mom was a follower of Jesus and believed in prayer. I would probably not be serving God in the ministry today if my mother had not prayed urgently for me! The difficult trials she endured (many from her three sons!) forced her to depend on God. Another great lesson I learned from Mom was the power of consistency. 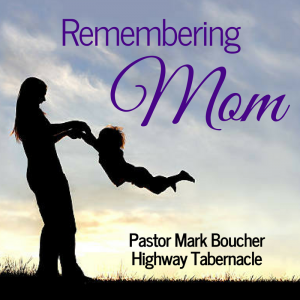 She knew the importance of providing spiritual experiences for her sons, even though my dad did not share her convictions. So, every Sunday she went to church and brought us along with her. As we grew older, it was harder for her because we sometimes complained and chose to stay home with Dad. However, she remained firm in her belief that we needed the church. I’m so glad she persevered! It was through a Sunday morning message at church that Jesus took hold of my heart and changed my life! I believe the greatest lesson my mother taught me was the importance of persevering. Mom had struggles with cancer at two times in her life. God healed her the first time but chose to take her home during the second battle. I remember my last visits with her as she lay on her bed for several months, continually getting weaker. Although her outward person was wasting away, her inner person in Jesus remained steadfast and strong. She enjoyed having me read the Bible and pray with her. She never blamed God or gave up on Jesus. The Lord Jesus was her life and she is now with Him forever…no more pain or suffering! I am so grateful for my Christian mother who taught many great life lessons. My prayer today for you, Moms, is that Jesus would keep you faithful and give you strength every day so that you can leave a godly legacy to those who follow.